This walk: 2014-2-26. Meavy village, Royal Oak public house, old oak, replacement oak, war memorial, Meavy Village Cross, St. Peter's Church, lych gate, snowdrops, Lower Meavy Bridge, River Meavy, church path, clapper bridge, Callisham, Lovaton, Burrator Dam, rainbow, hazel catkins, Marchant's Cross, Higher Meavy Bridge, ford. A propitious starting point, the Royal Oak pub at Meavy, on the village green: a former 15th Century church house inn. Aficionados can follow the inn on it's Facebook group. The anciant oak and the church tower. The old oak, lych gate and church tower behind. St. Peter's Church, Meavy - this photograph is a montage of four images taken at "no zoom" on the camera, resulting in a "fish-eye" effect: it was not possible to fit the building into one image. Snowdrops in the church yard. Tim by the old oak to show the scale. River Meavy from Lower Meavy Bridge, looking upstream. Looking back at the gate at the other end of the path. Massive old beech tree, at SX 53778 66952. Clapper bridge over the stream by the old beech tree. We took the path to Lovaton. Mobile home with ground clearance, the sign on the side was for a landscaping business, strangely blurred compared to other lettering - it may have been seen at a bad angle. . I nearly broke my neck getting up the bank to take this over a fence! Wind-shaped tree with ivy. Soon, there was a complete rainbow - followed by rain! Close view - a cluster of flowers without petals - these are all male flowers, which appear before the =small, single female flowers, presumably to reduce self-fertilisation on the same tree. The head of the cross, showing the incised cross. The ford near Higher Meavy Bridge, I remember driving through here in the 1970's but I would think twice about doing that now! Much older, slightly wiser? Zoomed view across the ford. 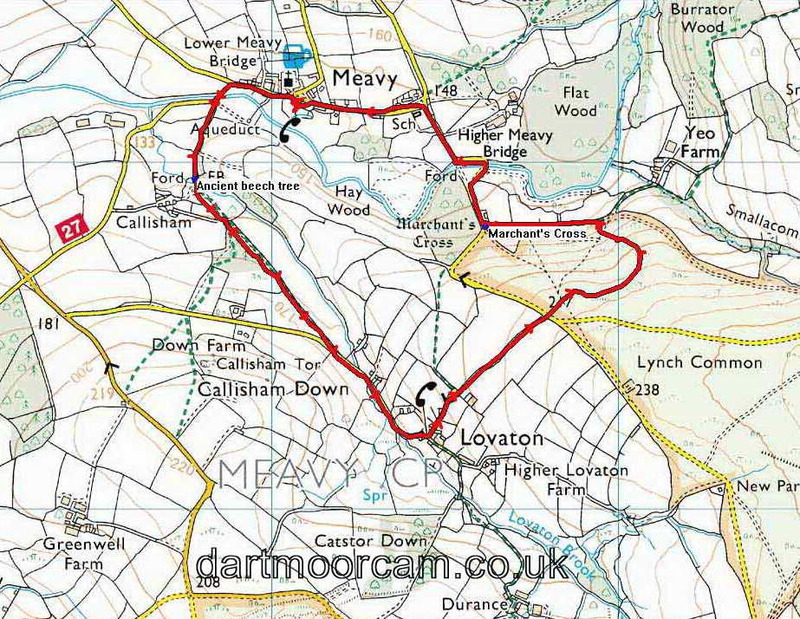 This walk was reached by turning right at Dousland beside the Burrator Inn and following the signs to Meavy: parking is available around the village green, on the road or in the car park behind the village hall. Distance - 3.97 km / 2.47 miles.